PACCAR achieved record quarterly revenues and excellent net income in the second quarter of 2018. PACCAR’s financial results reflect strong global truck demand, increasing PACCAR truck production and market share, and robust global aftermarket parts sales. PACCAR reported record first half net income of $1.07 billion ($3.04 per diluted share) in 2018 compared to net income of $683.3 million ($1.94 per diluted share) in the first six months of last year. Net sales and financial services revenues for the first six months of 2018 were $11.46 billion versus $8.94 billion last year. PACCAR repurchased 1.21 million of its common shares for $77.2 million during the second quarter, completing its previously authorized $300 million share repurchase program. The PACCAR Board of Directors approved an additional $300 million repurchase of outstanding common stock earlier this month. “The new $300 million share repurchase authorization reflects PACCAR’s ongoing excellent business performance,” said Mark Pigott, PACCAR executive chairman. In addition, the Board of Directors increased the regular quarterly cash dividend by 12%, to twenty-eight cents ($.28) per share, in May 2018. “PACCAR has a proven track record of delivering quarterly and special dividends in the range of 45-55% of net income to its shareholders,” Pigott added. Record consolidated net sales and revenues of $5.81 billion. Net income of $559.6 million, an after-tax return on revenue of 9.6 percent. Truck, Parts and Other gross margins of 15.0%. Record PACCAR Parts revenues of $968.0 million. Record PACCAR Parts pre-tax income of $194.5 million. Financial Services pre-tax income of $72.4 million. Manufacturing cash and marketable securities of $3.44 billion. Cash generated from operations of $673.2 million. Record stockholders’ equity of $8.78 billion. Consolidated net sales and revenues of $11.46 billion. Net income of $1.07 billion, an after-tax return on revenue of 9.4 percent. Financial Services pre-tax income of $139.9 million. Cash generated from operations of $1.20 billion. Medium-term note issuances of $1.30 billion. “DAF achieved a record 16.5% market share in the European above 16-tonne segment in the first half of 2018,” said Preston Feight, PACCAR vice president and DAF president. “Customers benefit from the reliability and fuel efficiency leadership of the DAF XF, CF and LF trucks. DAF above 16-tonne truck orders increased 26% in the first half of 2018 compared to the same period last year.” European truck industry registrations in the above 16-tonne market are estimated to be in a range of 300,000-320,000 vehicles in 2018, which would be the third highest in history. Kenworth, Peterbilt and DAF delivered a record 46,400 trucks in the second quarter of 2018, 18% higher than the same period last year. “Truck deliveries increased in North America, Europe, Australia and Brasil in the second quarter, reflecting strong customer demand for the industry-leading Kenworth, Peterbilt and DAF trucks,” said Darrin Siver, PACCAR senior vice president. DAF, Kenworth and Peterbilt are leaders in the development of battery electric, hydrogen fuel cell and hybrid vehicles. PACCAR is actively field-testing these powertrains in North America and Europe. The Kenworth T680 Zero Emission Cargo Transport (ZECT) and the Kenworth Hybrid Electric Cargo Transport (HECT) trucks will be in field trials this year at the Ports of Los Angeles and Long Beach. The ZECT uses a hydrogen fuel cell that combines hydrogen gas and air to produce electricity. The HECT incorporates a parallel hybrid propulsion system that uses a compressed natural gas engine and lithium-ion batteries. The Peterbilt Model 520 is a leader in the low-cab-forward truck segment with 32% market share year-to-date through May 2018. Peterbilt has designed a battery electric Model 520 equipped with a 400 horsepower electric drive system, 350 kWh of energy storage and regenerative braking. The truck’s 80-mile range and quiet operation is an excellent solution for residential neighborhood refuse operations. 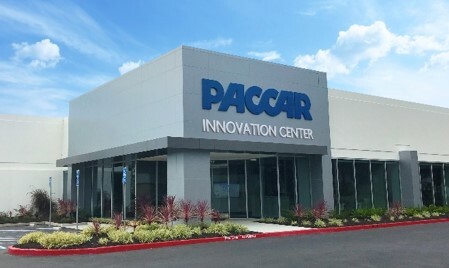 PACCAR Parts achieved record quarterly revenues of $968.0 million in the second quarter of 2018, 18% higher than the $823.1 million achieved in the same period last year. Second quarter 2018 pre-tax profit was a record $194.5 million, 29% higher than the $151.2 million achieved in the second quarter of 2017. PACCAR Parts first half 2018 revenues were $1.91 billion, compared to $1.61 billion for the same period last year. PACCAR Parts achieved pre-tax profit of $386.3 million in the first six months of 2018, compared to $302.0 million earned in the first six months of 2017. PACCAR’s excellent long-term profits, strong balance sheet, and intense focus on quality, technology and productivity have enabled the company to invest $6.1 billion in capital projects, innovative products and new technologies during the past decade. “Capital of $425-$475 million and R&D expenses of $300-$320 million are being invested this year in new truck models, integrated powertrains including electric, hybrid, hydrogen fuel cell technologies, enhanced aerodynamic truck designs, advanced driver assistance systems and truck connectivity. In addition, PACCAR is expanding its manufacturing and parts distribution facilities,” said George West, PACCAR vice president. PACCAR will hold a conference call with securities analysts to discuss second quarter earnings on July 24, 2018, at 9:00 a.m. Pacific time. Interested parties may listen to the call by selecting “Q2 Earnings Webcast” at PACCAR’s homepage. The Webcast will be available on a recorded basis through July 31, 2018. PACCAR shares are listed on NASDAQ Global Select Market, symbol PCAR. Its homepage is www.paccar.com.